What are the most common type of signs? Traffic signs are the most common type of signs. The top sign means drivers must stop. The bottom sign means drivers must turn right. 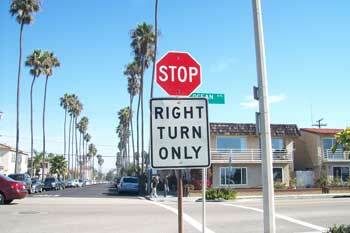 They cannot turn left or go straight. What is a fire lane? 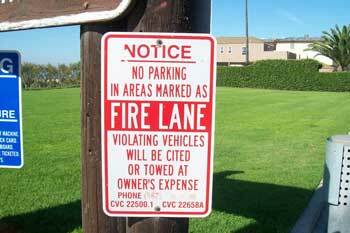 A fire lane is a lane for fire trucks and other emergency vehicles. You cannot park in a fire lane. Copyrights to the pictures and photos on this ESL and EL Civics website belong to individual photographers. We have purchased the rights to use them. Do not copy the pictures and photos on this education website. You may print the worksheets for classroom or home study. Contact Christina Niven, ESL teacher, at christina@elcivics.com. Please send corrections and requests for new lessons. Copyright © Christina Niven, 2007.